D’Oude Pastorie is a brasserie/restaurant located in Kraainem, near Brussels. 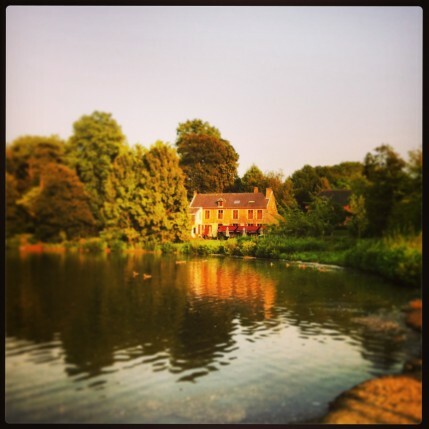 The former vicarage (dating from the 17th century) is situated in the park of the Castle Jourdain, a green oasis in the suburbs of Brussels. Inside the restaurant, we find a rustic interior with lots of wood, dark colors, an open fire and ta mix between traditional decorations and modern art. Gaëtan Colin manages D’Oude Pastorie and is known from his other restaurants Jaloa Gastronomique (1 Michelin star) and Brasserie du Jaloa. His third installment D’Oude Pastorie opened last year and already received a Bib Gourmand in its first year. Gaëtan is a young chef and keen entrepreneur who is driven by passion and creativity and who is known for his love for authenticity of local products and unpretentious dishes. The food in D’Oude Pastorie is unpretentious and rather traditional, where quality meat from the grill plays an important role: Lamb Crown of the Pyrenees (€ 26), Grilled Veal sweetbreads (€ 28), Saler ribs (€ 27) and T-Bone Angus USA (€ 34) are some of the grill specialties. There’s also an interesting three-course menu which offers a choice between one of the seven entrees, seven main courses and cheese or a dessert – for only € 35. This menu offers a good price/quality ratio and you can choose between more classic preparations or rather creative dishes with Mediterranean and Asian influences. Grilled loin of beef from Normandy, aged 40 days, served with chicory, tomatoes and fries. We started the evening on the sunny terrace with a glass of Champagne Philippe Prieu Brut. To accompany the meats we chose a red ‘La Maurelle’, Crozes Hermitage of the ‘Maison Bouachon’. D’Oude Pastorie offers a safe choice for decent lunch or dinner near Brussels. Qualitative no-nonsense food is served in a green and beautiful setting and especially the three-course menu guarantees good value for money.